Fictional places have a strange allure. They will never be visited except in the imagination. Details must necessarily be invented and staged. 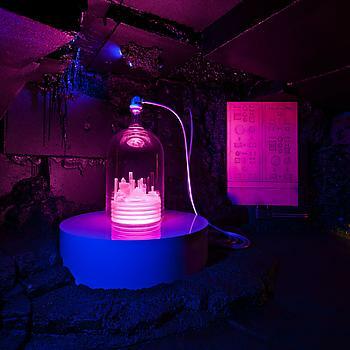 Mike Kelley continues an ongoing project dedicated to Kandor, Superman’s birthplace, which he now keeps alive in artificial conditions like a organism on life-support. But Kandor presents a challenge to any re-enactment because the comic strip offers so many differing examples, embodying the multifarious and contingent nature of cities, subject as they are to infinite representation. The centerpiece of this show is a grotto made of imitation black rock within which sits a resin model of Kandor emitting a rosy, seductive glow like a giant jelly. Sealed within the sustaining environment of a bell jar, fed a special gas, Superman keeps Kandor alive as a fragile utopia. His fortress is reminiscent of sacred shrines where our loss of innocence can be contemplated with sorrow but also where redemption may be planned. Kelley takes the Superman conceit and addresses it with theatrical relish. Kandor assumes multiple forms, sometimes resembling melting polychromatic glass orbs or erect columns of crystals pointing skyward in the style of Art Deco futurism. Superman’s idealism is perceptible but his physical absence is telling. He idealizes the past and projects fantasy into the future, but must constantly slip away. Inserted into the Superman theme are some conscious but disorientating digressions. A film with characters inspired by Hammer House of Horror plays out sado-masochistic rituals involving corn cobs and whips. Titled ‘Vice Anglais’ after the reputed sexual repressions of the English, Kelley takes his audience on a sinister tour through human cruelty but links the film to the wider exhibition by staging the melodrama on a set using the Superman themed works. Another sculpture titled ‘Tie A Yellow Ribbon’ creates a tableau of sentimental objects memorializing ‘S/andy’ to accompany images of both a Marine and young woman. Such an ambivalent gender echoes Superman’s own overlapping identities and suggests the performative nature of human relations. Kelley’s interrogation of comic book values produces dazzling formal work but risks aestheticizing the source-material to the point of entertaining irrelevance. Unlike Roy Lichtenstein’s detached translations of graphic novels, Kelley’s appropriations are close to overreaching.